I have been collecting data from Raleigh’s trails and parks for the last couple years. My primary platform has been a custom Arduino board I developed for low-cost (hey, these things may get damaged or stolen) and long battery life. I wanted a connected sensor to provide current data and, after looking at various technologies, I have settled on cellular as the most convenient. 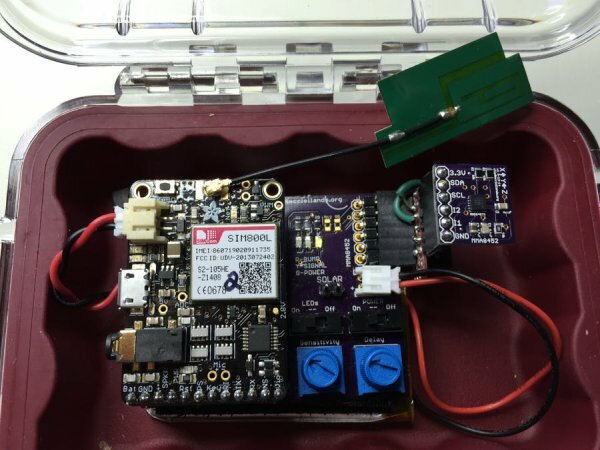 This sensor uses an off-the shelf Adafruit FONA board for the cellular communications. At $39 with an easy to use library and the issues of power consumption spikes solved, this is a great value. 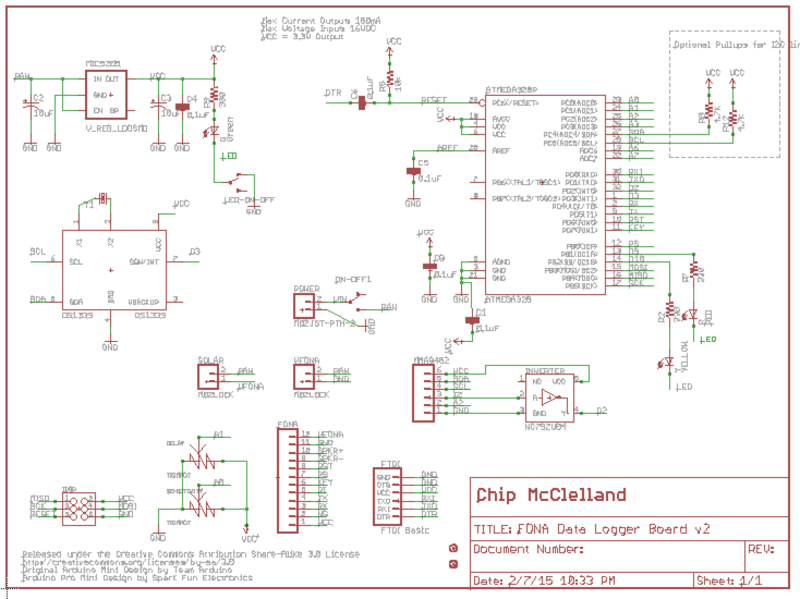 I developed a carrier board to support my i2c connected sensors, support some field adjustments (with two potentiometers) and display status with three LEDS. This board is designed to run off a LiPo single-cell battery and can accommodate optional Solar charging (see my other projects). I have been operating this data logger with my Solar Power manager for some time now and wanted to share the results. Below are a couple screen shots showing the Ubidots Dashboard for this data logger and a closer look at the battery charge level over a month’s time. Notice that with a relatively small solar panel and battery, I have been able to report hourly each day without the battery charge level going below 87%. The hardest part was in writing the software to manage all the issues that can arise when trying to send data over a 2G GPRS connection. I ended up writing my own code to manage the excellent Adafruit library commands and documented it on the Ubidots site. With this code, I could re reliable connections and up to 10 days coverage from a 2000mAH LiPo battery. The Solar power project keeps this system running with only 3 hours of sunlight a week. One of the issues I have looked into is the cellular data plan. As this is a 2G modem, you need to understand that the networks that support this device are being replaced by 3 and 4G versions. In my area, Raleigh NC, there are only two – T-Mobile and AT&T who has committed to keep them going until 2017. I started with T-Mobile pre-paid SIMs which give unlimited 2G data for $2/day and don’t charge when you are not using them. This is great when you are doing intermittent development and test but expensive after that. I then moved to a machine to machine (m2m) provider Embedded Works. who offered a Vodafone card that uses the AT&T network (see hardware list below). This gave me much better network performance and costs only about $42 for 6-months of services as long as you stay under a 5Gb/month cap. Now, Sparkfun and Adafruit have m2m plans as well which I will certainly consider at renewal time.